I have never been very fond of lamb. As a kid I maybe tried it twice with yucky mint jelly. It tasted gamey, musky and, until a couple years ago I would have told you I hated lamb! Funny thing is there are a lot of folk out there who still don't like lamb because of that one time they "tried" it with the dreaded bright green "mint" jelly! A couple years ago we were trying to eat healthier and decided to give lamb another go-round. It was then I discovered a recipe on FoodNetwork by Giada DeLaurenta for lamb chops. While I have yet to cook lamb chops because they are very pricey, I copied Giada's recipe off the Internet, stuffed it in one of those plastic sleeves and put it in my entree notebook. It has become my marinade, of choice, for most any lamb I cook! 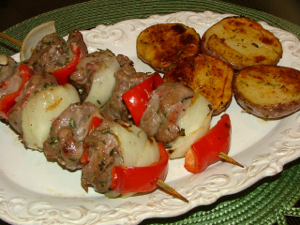 The ingredients are simple, savory, and take lamb to the 5-star restaurant rating! If there were any herbs I would recommend that you grow, it would be the herbs for this marinade, rosemary, thyme and if you have the room, garlic. Rosemary and thyme are very easy to grow in large pots. I purchased my 22-inch pots from Sam's Club. You only have to make the investment once and the plants will keep on growing. If you live a climate cooler than the Arizona desert, you may have to bring your herbs inside during the winter months. Each spring I trim them up, add more soil to my pots and I have fresh herbs all year long! Potted herbs are convenient, economical, organic, fresh and their flavor is a - mazing! I buy a fresh leg of lamb, remove the fascia (tough, white, striated tissue) and fat, with a sharp knife, while cutting meat it into bite-size pieces. I marinate half of the lamb pieces. The remainder is stored in quart-size bags, labeled, dated and stored in the freezer. Leg of lamb cut into bite-size pieces, fascia and fat removed. To make marinade- Finely chop garlic, rosemary leaves and fresh thyme. Mix in salt and extra virgin olive oil (my preference) or place ingredients for marinade in food processor. Using cutting blade, pulse ingredients into a paste. 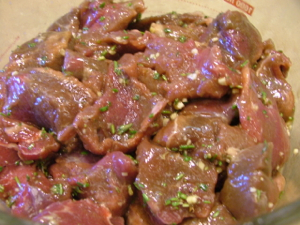 Place lamb pieces in dish or quart size plastic bag and thoroughly coat with marinade. Refrigerate for 2 hours and up to overnight for really tender lamb. Cut onion in quarters and separate pieces. Cut and seed red pepper into aprox. 1 1/2-inch pieces. 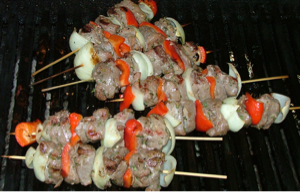 Thread veggies and lamb onto wooden skewers. 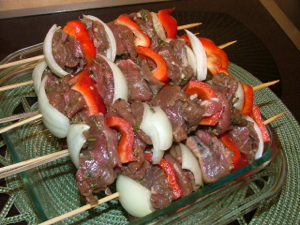 Lamb Kabobs ready for the grill. Preheat gas grill for 10 minutes, all burners on HIGH. Place a pierced foil packet of mesquite chips underneath the grating. Turn heat to MEDIUM - OFF - MEDIUM (MOM). Cook first side for 5 minutes, turn, cook for 3 additional minutes for medium rare. 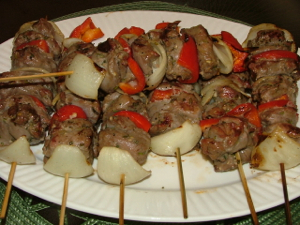 Will and I served these lovely Lamb Kabobs on Christmas Eve without telling anyone they were eating lamb. Even the sworn "lamb haters" absolutely loved them . . . And then they were told . . . they were eating lamb. Sometimes you have to be a little tricky, to help folk expand their culinary boundaries! We are all lovin' lamb . . . Over at Julie's!!! A Little Bouquet for You! Radish . . . any one?